Western Australian transporter Centurion has unveiled a new trailer innovation to improve the movement of heavy mobile equipment tyres. According to the transport company, the new trailer doubles the load of previous tyre trailers and removes the need for an oversize permit by carrying large-scale tyres in an upright position. With the trailer design, Centution says haulers will be able to utilise the advantages of a triple road train configuration for the first time as they would no longer need to carry the tyres horizontally on a flat top trailer in a single trailer configuration. 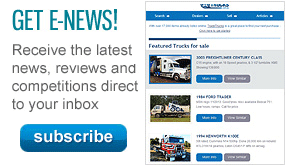 Centurion’s executive general manager Justin Cardaci says the new trailer, capable of being used under the Performance Based Standards (PBS) scheme and fitted with electronic stability control, offers both safety and efficiency gains. "We transported more than 2,600 heavy equipment tyres last year to various mine sites across WA so the development of the new trailer is an important innovation for our business," Cardaci says. 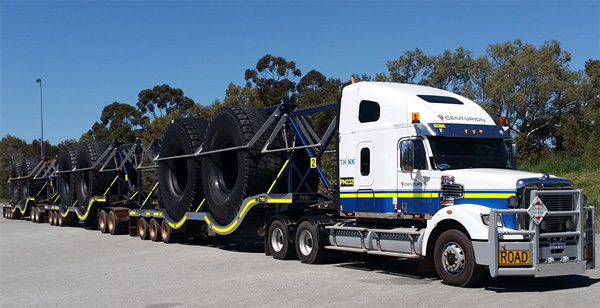 "The trailer allows us to transport some of the largest heavy mobile equipment tyres as part of a triple road train configuration which significantly improves our efficiency and boosts our productivity in this area." Developed over 12 months in conjunction with another WA business, the trailer also has safety features before and after the journey. "The automation of tyre loading and unloading and the reduction in manual restraining minimises the risk of injury and makes the whole process of transferring tyres to mine sites safer," Cardaci says. "The tyres are locked into place remotely which means the operator is always a safe distance from the trailer during a critical part of the loading."